Ducktales Woo-oo! is return of the beloved series from the late 1980s. With new voice actors, I wasn’t sure if my fanboy heart would understand. But I’m glad to say that I enjoyed the 44-minute episode when the review copy arrived. Leave a comment on this blogpost with your favorite character from Ducktales in order to enter to win a copy of the DVD! See the rules at the bottom of the post. The action of the show surprised me and it brought back warm feelings of the older series. I think most Ducktales fans will enjoy the show, especially if they give Tennant a chance. He’s missing the warmth of Alan Young, but Tennant’s Scrooge grows and changes through the episode. It’s a great reboot and I’m glad to see Disney pander to the fans, including the celebrity fans, with this one. I enjoyed the art style of the animation. The backgrounds had a comic book page flatness to them, which allowed the traditional characters to have a new design that’s more modern. If you didn’t get a chance to see it on Disney XD, then I think you should check this one out. Maybe your local public library has a copy you can borrow! 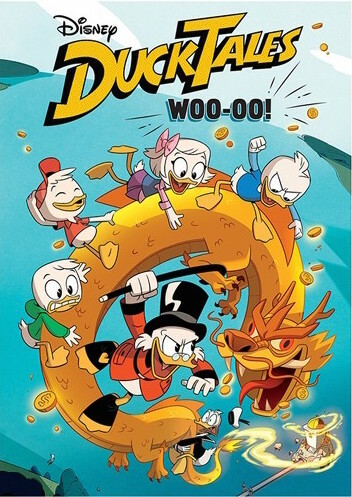 Are you going to pick up Ducktales Woo-oo!? CONTEST (“CONTEST”) SPONSORED BY Walt Disney Studios Home Entertainment (“SPONSOR”) AND ADMINISTERED BY ImagiNERDing. (“ADMINISTRATOR”). CONTEST BEGINS ON Thursday, December 21, 2017 AT 8:00 A.M. EST AND ENDS ON Thursday, December 28 at 11:59 P.M. EST(“CONTEST PERIOD”). NO PURCHASE NECESSARY TO ENTER OR WIN. ONLY AN EMAIL ADDRESS is required. By participating, entrants agree to be bound by these Official Rules and the decisions of the Sponsor and Administrator. Void where prohibited by law. Contest is open to legal residents of the United States of America who have reached the age of majority in their respective province or territory of residence at the time of entry. Employees or contractors of the Sponsor(s) and immediate family members of, and any persons domiciled with any such employees or contractors, are not eligible to enter. 1 winner(s) will be chosen at random using a random number generator. The odds of winning will depend on the number of entries received. The winner will be sent an email and will have forty-eight hours to respond. If no response is received within forty-eight hours, another winner will be chosen. Administrators are not responsible for prize fulfillment nor for any technical failures. Winning entry will be verified. A list of winners will be displayed on the giveaway widget on the original contest post. Launchpad is my favorite character. Scrooge McDuck has always been my favorite DuckTales character. I think that he is a great funny character. Thanks for the giveaway. For a while, I really liked Gizmo Duck, but now I’d say I’m back to favoring Scrooge. Good take on the reboot. I’ve been enjoying the new series. I think Huey and his quick-witted, deadpan style steal the show most episodes, and has emerged as my fave!